I had the good fortune to be invited to participate in a panel discussion on modernizing health care this morning that was sponsored by the Washington Business Journal and UnitedHealthcare. Dr. Reed Tuckson delivered the keynote address. He's a compelling speaker and I want to share some of what I took away. Dr. Tuckson shared a graph similar to this. I've seen it before, but always find it shocking. 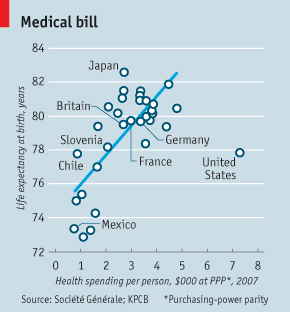 We spend more per capita than any other country on health care yet it doesn't correspond to an increase in life expectancy. Even more shocking, he shared that the U.S. is ranked 43rd in the world in children surviving their first year of life. 27.5% of Americans are obese. If the current trend continues, 43% of the U.S. populations will be obese by 2018. 55% of adults report getting no vigorous activity. 32% get no activity at all. 50% of high cost claimants used lest than $5,000 in care the year before. He talked a bit about sensor based data -- digital smart band aids and apps with devices to monitor and track blood pressure. And, he showed us some of the apps UHC has developed. He placed a lot of emphasis on evidence based medicine. Another scary statistic, 50% of the time health care is not consistent with science. He shared that there is no correlation between the quality of care and the cost of care. UHC is putting a lot of effort into identifying quality care and steering their insureds to quality providers. He mentioned that UHC is seeing a trend toward businesses requesting smaller, high quality networks. At one point in his presentation, Dr. Tuckson said, "Trust is key." This couldn't be more true. If I do what I'd like, I expect a small number of folks to be put off, but I believe the majority would be glad to receive the information. We've built our wellness program slowly over many years and I think most staff know we truly care about their health and well-being. Dr. Tuckson recommended a number of books to the audience. As a bookworm, I decided this deserved a post of its' own. So, stay tuned. I'm grateful to have been included in today's discussion. I enjoyed meeting the other panelists -- Janet Stypula from Orbital Sciences Corporation and John Miller from the MidAtlantic Business Group on Health. Alex Orfinger, the Publisher of the Washington Business Journal, did a nice job of moderating the panel.